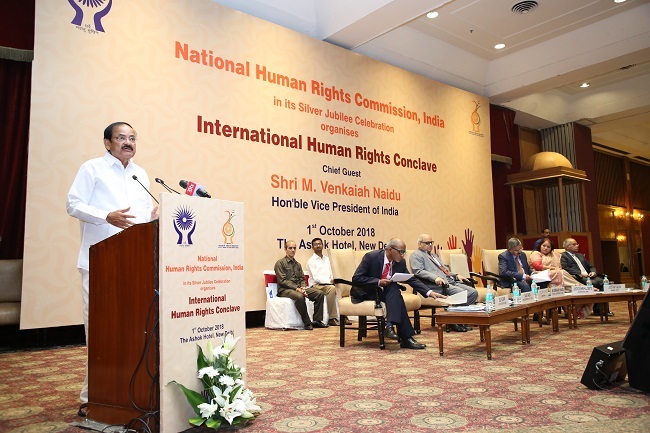 To mark the Silver Jubilee Year Celebration, the National Human Rights Commission of India celebrated its third event in the form of International Human Rights Conclave at the Ashok Hotel, New Delhi on October 1st, 2018. The inauguration opened with a rendition of the Vaishnav Jan - a song that best reflects the work and vision of Mahatma Gandhi. 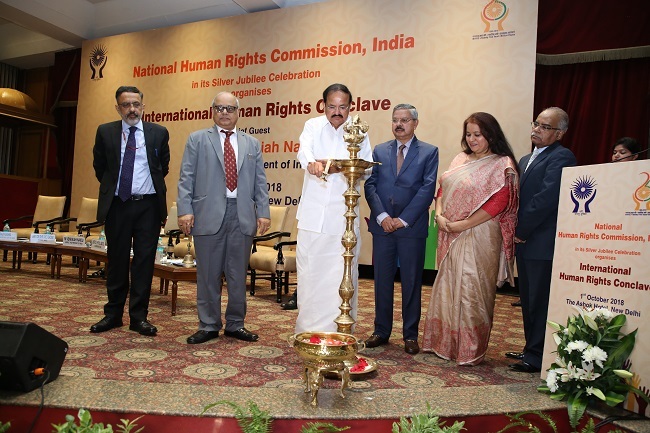 This was followed by the lighting of the lamp by the Chief Guest, Hon'ble Vice President of India, Shri M. Venkaiah Naidu along with the NHRC Chairperson Justice Shri H.L . Dattu, Hon'ble Member Justice P.C Ghose and Smt. Jyotika Kalra, Secretary General Shri Ambuj Sharma and other esteemed guests of honour. The International Conclave is aimed at providing the platform to the national human rights institutions of various countries, global networks of NHRIs, government and non-governmental organisations and other stakeholders to share their views and to deliberate on the road ahead on important human rights concerns. Mr. Ambuj Sharma, Secretary General, NHRC, highlighted the work done by the NHRC in the past 25 years by bringing together all stakeholders and NHRIs to ensure and safeguard the broad based mandate of the NHRC which was established under the Protection of Human Rights Act 1993. He further listed the significant initiatives undertaken by the NHRC such as - online Human Rights Pledge, online complaints registration system, toll free national helpline, bilingual content rich website to make it accessible, open house discussion on issues on sexual violence against women and children, prison reforms etc. He assured that the conclave will prove to be an important step in securing HRs for all. Shri Rajiv Gauba, Union Home Secretary, GOI, in his address, stated that NHRC is a central figure in the institutional architecture of the country. India has always worked towards protection of socio economic rights of the backward persons of the society through a robust legal regulatory framework establishing rule of law and protecting civil political and fundamental rights of the people. The NHRC, along with National Commissions for women, scheduled castes, scheduled tribes, and minorities, is helping the government to meet Sustainable Development Goals by 2030. Justice Mr.H.L. 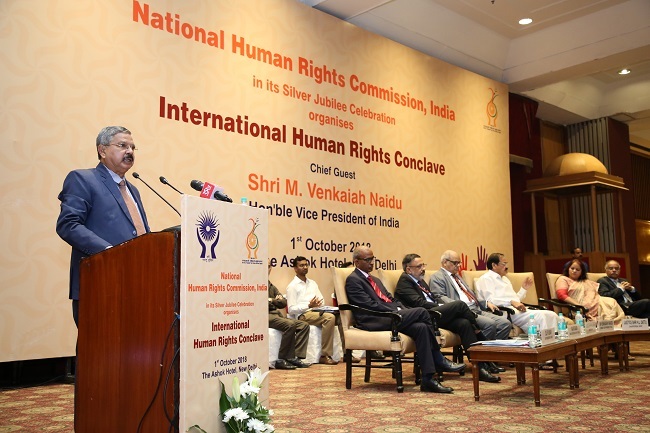 Dattu, Chairperson, NHRC welcomed everyone to the international human rights conclave, marking the 25 years of the pioneering work of NHRC in protection of human rights in India. The chairperson took the occasion to identify the various achievements in the past years and reflected on the important milestones highlighting the significant contributions of the NHRC in the field of mainstreaming human rights culture in the country. He also deliberated upon creating widespread awareness, sensitisation of the public and strengthening constitutional and legal provisions which thereby provide extensive system of checks and balances. By monitoring human rights situation through camp sittings, open hearings, setting up of a bonded labour cell, appointment of special rapporteurs, constituting core and expert groups, NHRC is acting as a focal point for human right defenders. The chairperson identified poverty, gender inequalities, bonded labour, trafficking, displacement of refugees as some of the significant challenges to human rights protection. NHRC is a member of the Bureau of the Global Alliance of NHRIs(GANHRI) and has been accredited with 'A' status by GANHRI throughout its existence. Human development means widening and deepening the scope of freedoms available to all people without any exception. A true commitment to human rights will require concerted efforts to nourish the rich diversity of all people and develop mutually enabling relationships through progressive economic and social policies. Mr. M. Venkaiah Naidu, Honorable Vice President of India expressed that the protection of inalienable rights is the primary duty of the state. Human rights are looked upon as indispensible to meet the sustainable development goals by 2030. He mentioned that human rights include right to healthcare, food, education, business, issues of the youth and elderly etc. India has been a strong voice about HR globally. India follows a 'Share and Care' philosophy and is a signatory to many human rights conventions. He identified the growing role of the NHRC as the watchdog towards protection and redressal of violation of human rights. He delineated several threats towards ensuring redressal of human rights. Corruption, poverty, terrorism, climate change are some of the critical challenges facing the country and the world. India is a huge and diverse country and consequently, the numbers of complaints are many and the earnest efforts are being made by the NHRC in redressal of the same. He stressed on the fact that the legislations alone cannot ensure guarantee of human rights to each and every individual. The need of the hour is to take the changing demographic realities into consideration while concentrating on effective implementation. The United Nations and member countries must come together to address the growing number of economic criminals and terrorists seeking refuge in other counties. The exchange of fugitives and information between these stakeholders is an important tool to address this. The world must speak in one voice. He appreciated the reservation of women provided in the local bodies and Panchayati Raj Institutions in India which has resulted into positive change in the working of these institutions as well as it has empowered the women also. The Conclave, besides the inaugural session, was divided into three thematic sessions namely (i) Emerging dimensions of human rights with focus on trafficking/ migrants/forced labour and rights of marginalized sections of society: sharing of best practices (ii) Protect, Respect and Remedy Framework of Business and Human Rights (iii) Empowerment of women and Protection of children with focus on sustainable development goals: challenges and road ahead. The event will contribute to the continuing dialogue and sharing of the best practices on above themes on the rights of all the diverse sections of the society. The sessions would further help to an create effective framework to enable the process of developing policies, programmes and practices which will ensure equal rights and opportunities for development, protection, participation and empowerment of all. The conclave saw excellent response by way of participation of delegates from UK, Afghanistan, Bangladesh, Croatia, Mauritius, Nepal etc. besides SHRCs, NGOs, Civil Society, diplomats etc.